If you go down in the woods today, be sure you don’t eat a toxic mushroom. New Zealand’s poisonous plants and fungi can have nasty effects, although few people die. Māori knew how to make food from certain poisonous native plants – such as cakes from the orange karaka berry. In your neighbourhood there may be some pretty, flowering plants or berries that are toxic (poisonous). Each year some New Zealand children need hospital treatment after touching or eating them. Plants make chemicals to keep away insects, animals or even other plants. Some of the chemicals are toxic to people or animals. How do they poison us? Plants may have poison in their leaves, flowers, berries or seeds. Some, such as nettles, will harm your skin. Others are poisonous if you taste or swallow them. The chemicals can cause problems such as skin rash, stomach pains, paralysis or blindness. There are very few deaths from plant poisoning in New Zealand, but about 75 people are treated in hospital each year. There have been more mushroom poisonings since the early 1990s. Only nine New Zealand native plants are a threat. These include the yellow seeds of the kōwhai tree, and blue tūrutu berries. The karaka tree and poroporo shrub also have poisonous berries, and the ngaio tree has poisonous leaves. Tree tutu: all parts of this small tree are poisonous. Even circus elephants have been poisoned by eating tutu. Tree nettle (ongaonga): the leaves have stinging hairs. Two hunters became very ill, and one died, after stumbling through nettles in the mountains. Children sometimes touch or eat toxic plants while playing in the garden. These include black nightshade (a weed with black berries), Jerusalem cherry (red berries), the large white arum or calla lilies (bright fruit spikes), and the white, trumpet-shaped flowers of datura (or thorn apple). Because British settlers didn’t know about New Zealand’s plants, some of their sheep and cattle died from eating tutu and ngaio. The settlers also planted oak (whose acorns are poisonous), yew and macrocarpa trees. Along with bracken fern, ragwort and other weeds, these can kill or harm cows, sheep or horses if they graze on them. A fungus found in grasses can cause staggers (stumbling and tremors) and facial eczema in grazing animals. Most mushrooms in New Zealand are not poisonous. But you should never eat them if you don’t know what type they are. Toxins in the death cap mushroom affect the liver and kidneys, and can kill you. 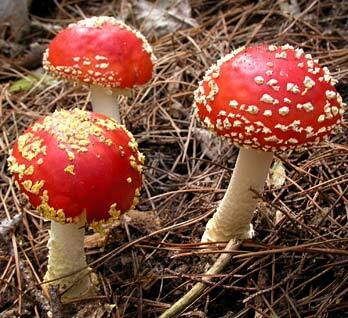 The fly agaric mushroom may cause stomach pain and vomiting.